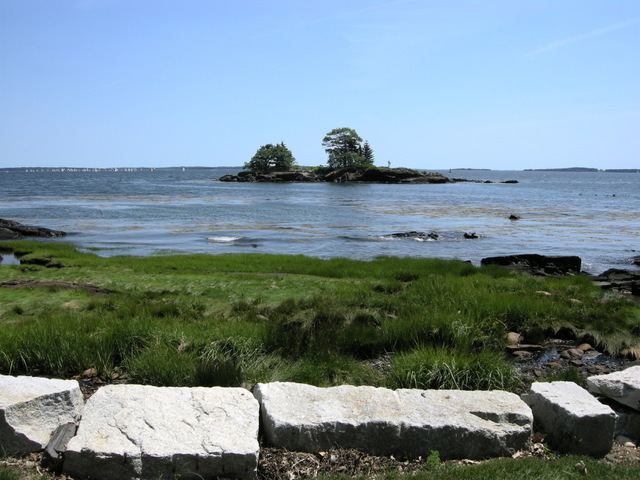 An iconic Maine view from one of the tour houses. 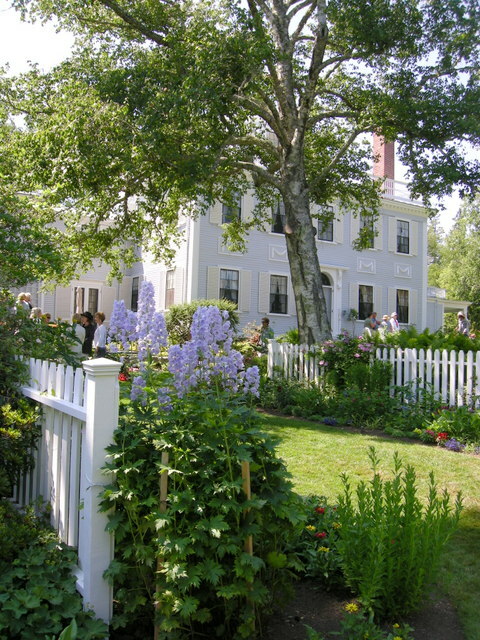 For the third year in a row, Michael and I traveled to Camden, Maine, to attend the Camden Garden Club’s House and Garden Tour. My last two posts covered all the beautiful containers displayed through out the town. To read them click here and here. This post will show highlights of the tour itself. 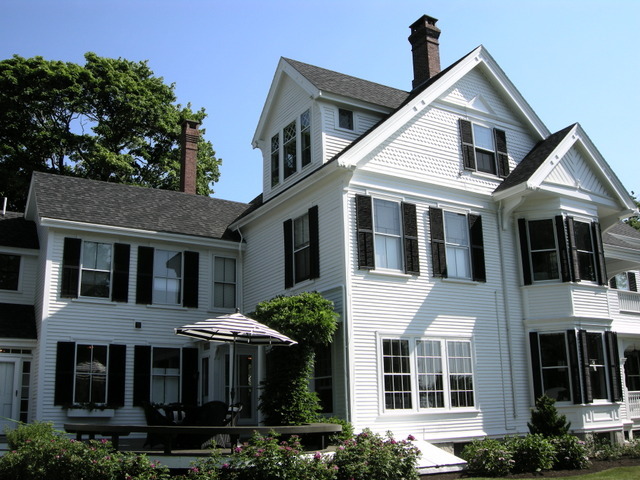 The Alden House, an 1855 Queen Anne Victorian, was just one of the seven historic houses on the tour. 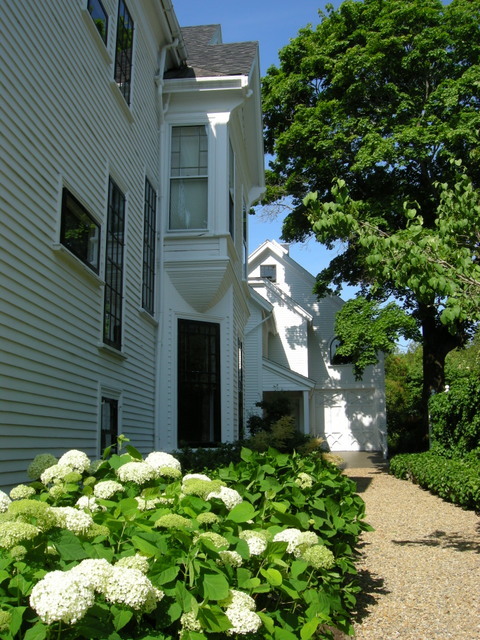 The first president of the Camden Garden Club lived there when the club was founded 100 years ago. 2015 marks the 100th anniversary of the Camden Garden Club. To celebrate, all the houses on the tour were historic. 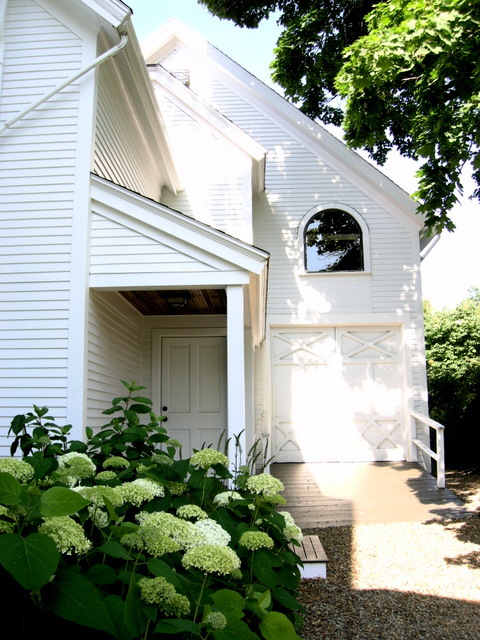 The oldest was built in 1806 and the newest in the early 1900s. It was fun to see all the beautiful architecture and the amazing ocean views that often accompanied it. However, only two houses had gardens worth visiting, which was disappointing and didn’t result in many garden photos. Nevertheless, I thought you would enjoy seeing the buildings and views. 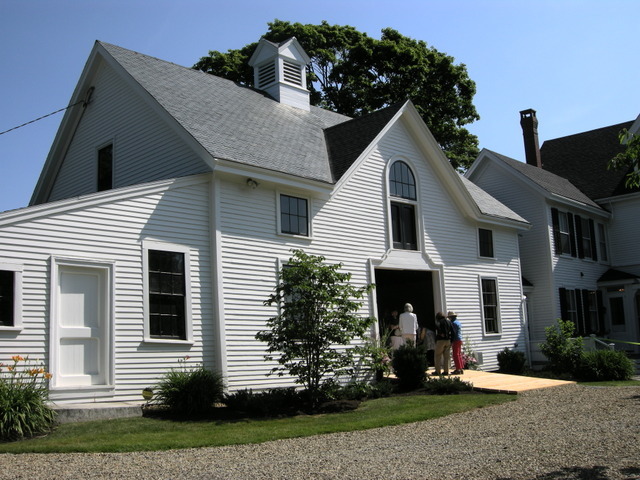 Alden House barn. Unfortunately, no photos were allowed inside the houses because I would love to show you how well preserved this home was. 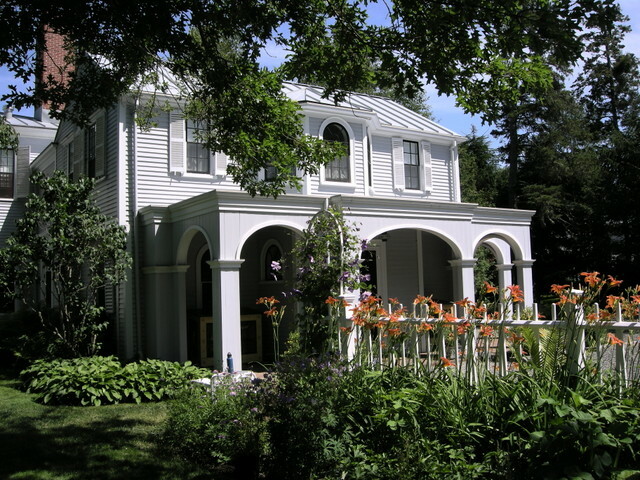 The Alden House had a lovely and classic shade garden along the back side. 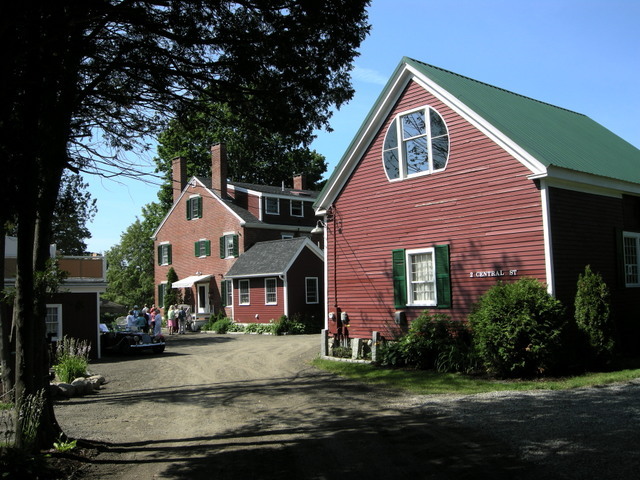 This Georgian-style brick home called Red Chimneys built in 1825 was the site of the first meeting of the club in 1915. 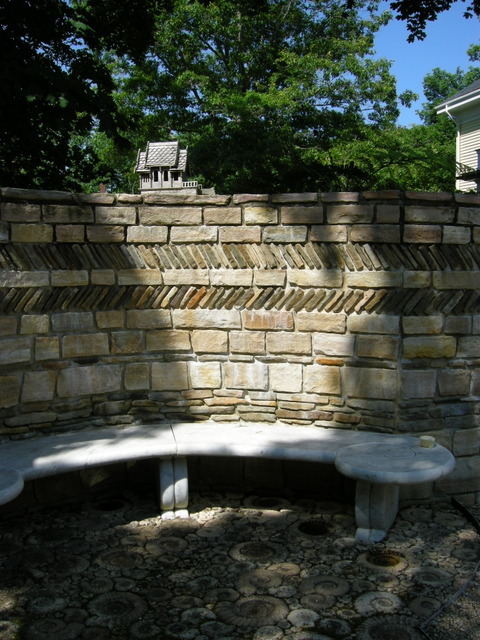 Lovely stonework found at Tranquility Garden in downtown Camden. A close up of the unusual “paving” shown in the photo above. The owners traveled all over the world for 30 years collecting ideas and objects for their garden. Tranquility Garden had lovely sun and shade borders. The bright sunlight and shadows made the gardens very difficult to photograph. 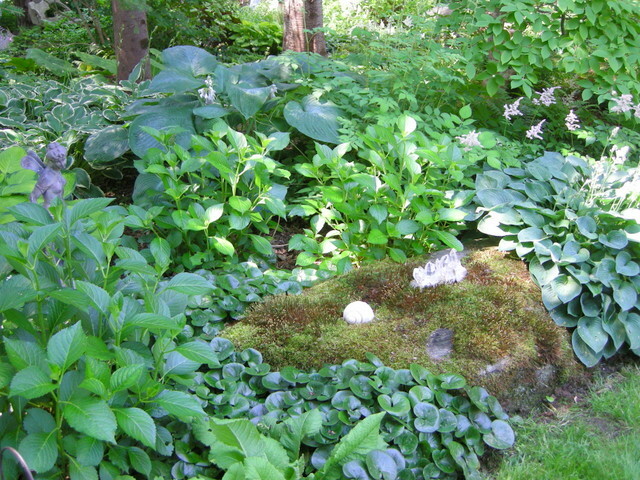 The combination of unusual textures was quite creative in this garden. 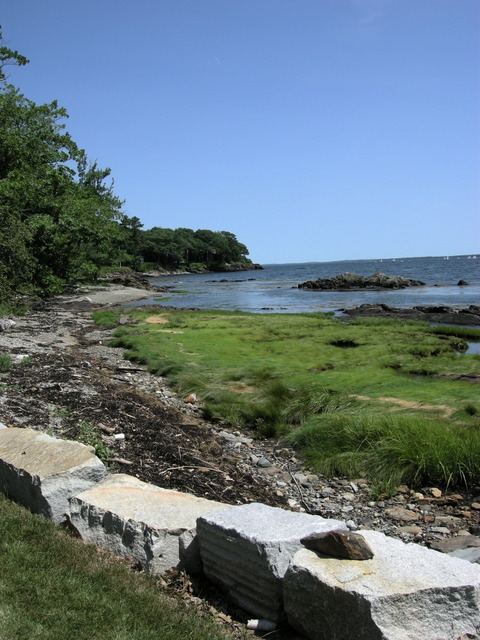 Although it had no gardens to speak of, this property on a prominent point in Camden Harbor had almost 360 degree views of the ocean. One of its views was of this little island. Another view was of this beach. 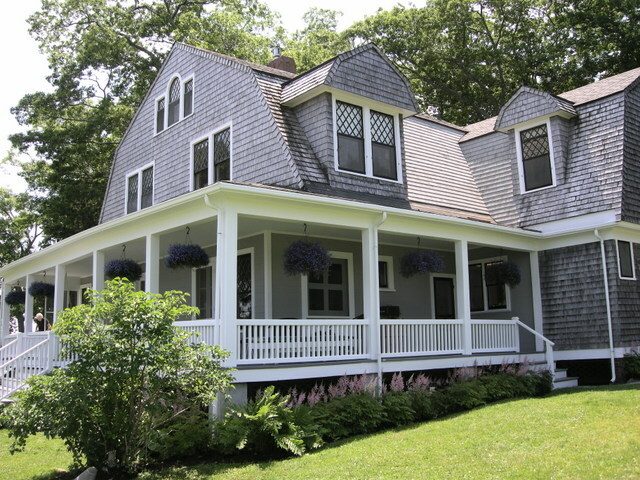 Gray Lodge is a shingle-style summer “cottage” built in the mid-1890s. 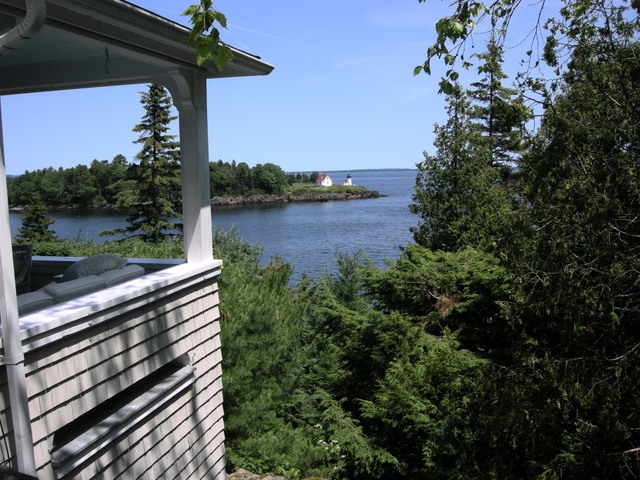 The view at the start of the post was from this porch and is of Curtis Island Light. So-called Spite House was the prettiest building on the tour. 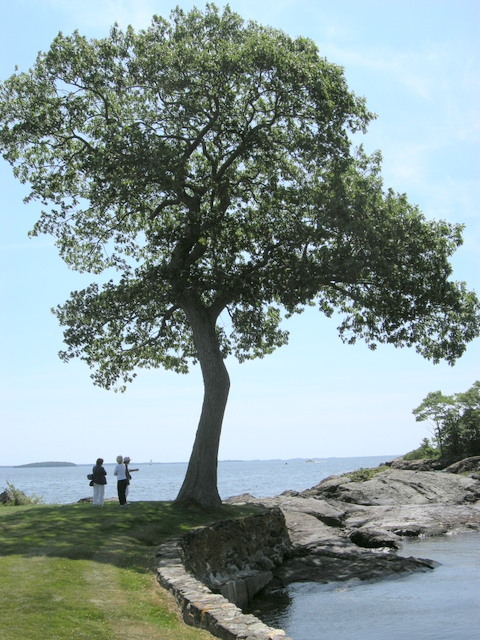 It was built in Phippsburg, Maine, in 1806 and floated on a barge to its current site in Rockport in 1925. I never found out the origin of its name. I discovered one new plant on the tour: Digitalis ‘Illumination Flame’. 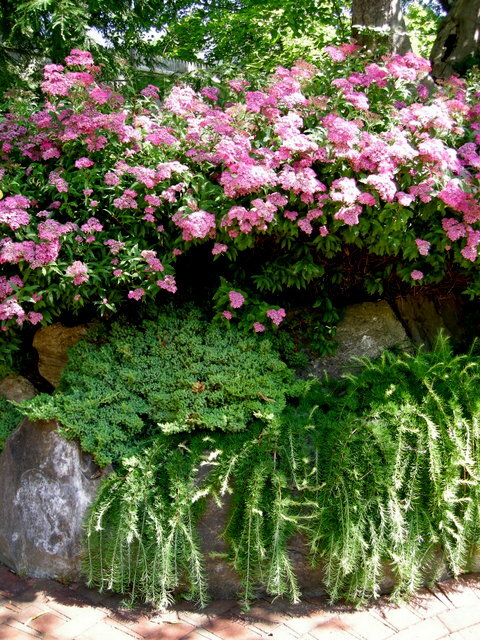 Although it is only hardy in zone 8 and above, the color and habit is so beautiful that I may have to grow it next year. 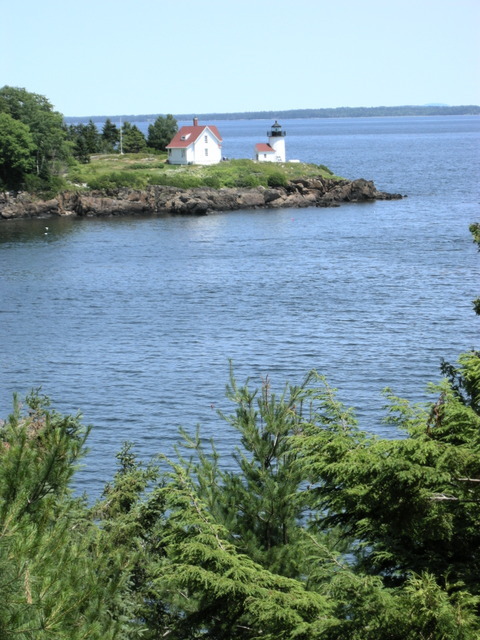 The Camden-Rockport-Rockland area is such a gorgeous place to visit, but after three years Michael and I plan to attend the Bar Harbor Garden Club’s tour in 2016. 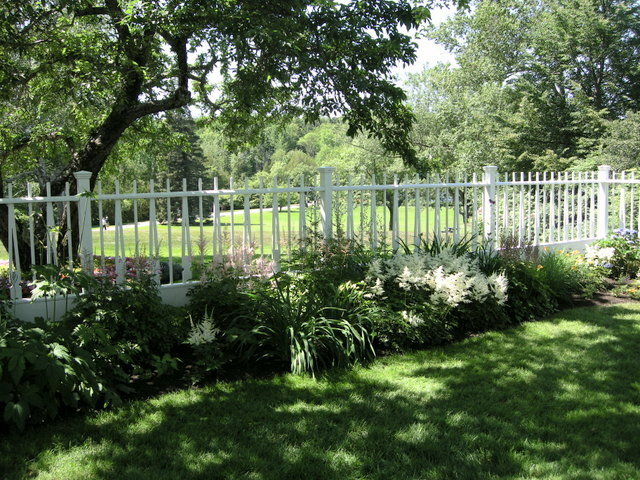 This entry was posted on August 21, 2015 at 6:38 pm and is filed under garden to visit, Garden Tour, How to, landscape design, Maine with tags Camden, Camden Garden Club, Camden Garden tour, Camden Harbor Maine, Camden House and Garden Tour, Camden Maine, Maine, maine gardens, midcoast Maine, Rockport Maine. You can follow any responses to this entry through the RSS 2.0 feed. You can leave a response, or trackback from your own site. 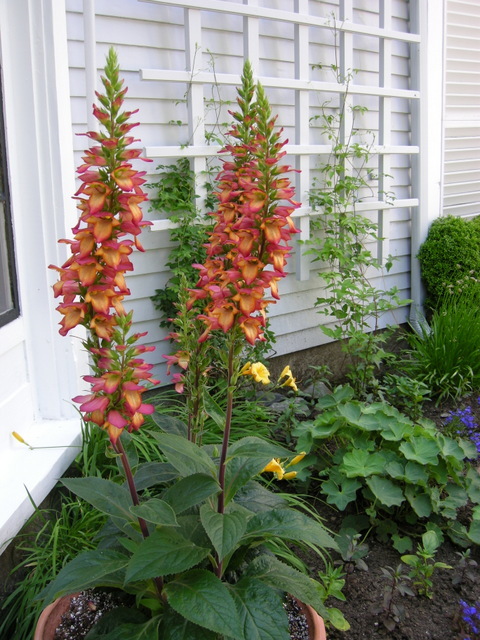 I have bought the plant Digitalis “Illumination Flame” in Amherst,Ma and on Nantucket for the past 3 years.Both nurseries labelled it as Digiplexis and state that it is a native of the Canary Islands.It grows like crazy here but has not wintered over.Kathy Tracey also sells it at Avant Gardens in S.Dartmouth,Ma. Great article–thanks.I will give it a try in the garage this winter and report back. 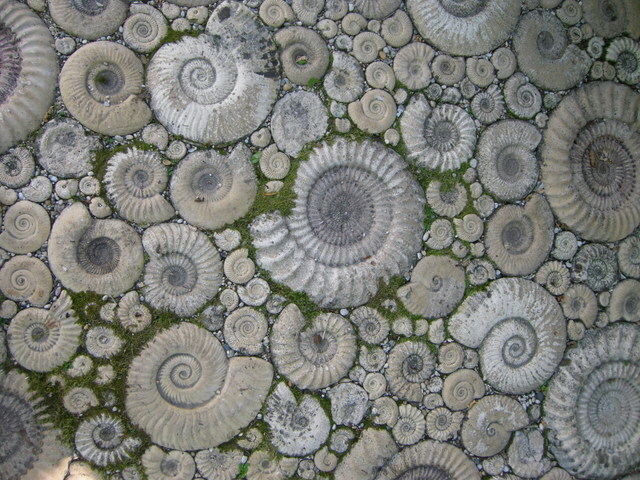 That ammonite paving is spectacular! Very cool! 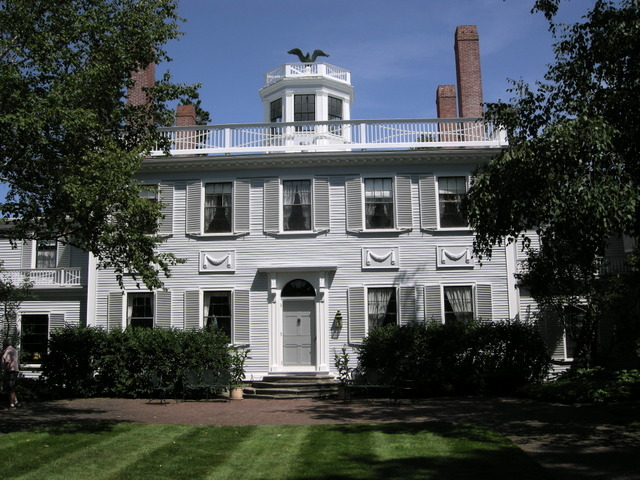 Are the windows in the Alden House and Red Chimneys, Bullseye windows? Thank you for taking us on your tour, it was very interesting to see all the different houses. and their stunning views. Loved the wall and “paving” in the Tranquility garden, stunning. Such beautiful containers! I love the new petunias but by this time of year mine are lanky and no longer so attractive. They are watered everyday automatically, and fed every two weeks. I do pinch them back but I suspect I don’t do it often enough. It’s so hard to pinch off lovely blooms! Have you written a blog entry that could help me to keep mine compact and blooming like those in Camden? I was in Camden but missed the garden tour. Incredible photos. I am reblogging on French Gardener Dishes. I live near you in Berwyn and have bought many shade plants from you over the years. Thank you for this excellent post! That’s disappointing! A Berwyn friend who summers in Camden loved the tour. I will ask her if she felt the same. I also enjoyed your posts on all the window baskets and planters from Camden.n they are enchanting aren’t they? I did a post on them also a few weeks ago. Have you discovered the Endless Summer Dahlia Farm in Camden? Will be writing about that in a few weeks. Very impressive selection of flowers and charming,knowlegeable owners and the farm is where they live much like your situation 🙂 small world! The tour was very nice, it just wasn’t about gardens. Beautiful homes and gardens. I do love that paving too. BTW, PA was cooking this week in the mid-nineties. Wish I visited at another time. It stormed (lightening) while we were at Winterthur, so no one got to see the gardens. We did see the home though and they allow photos which surprised me. I did not know that. It’s been a while since I got out to Camden. Maybe after Labor Day when the summer crowds die back a bit. These houses and views are lovely, but a house and garden tour that is mostly about the houses is inevitably a disappointment to garden enthusiasts. A 100 year old garden club! That is as remarkable as the lovely homes. Loved the unusual shell paving and the stonework of Tranquility Garden. 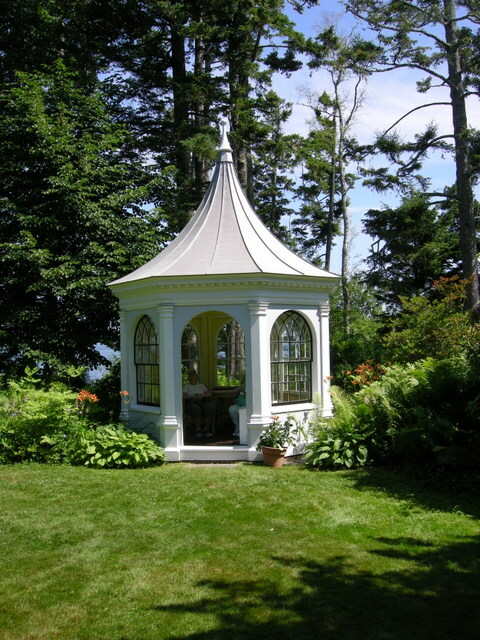 Oh my Carolyn….I am beyond words here…each house was amazing and the views are breathtaking…I love that gazebo! Maine is a beautiful place! I would do a lot to get my hands on that Digitalis Illumination Flame! I am in Zone 9 so I would have a chance at seeing it return. Any ideas where it can be found? You just need to Google it!